Any debate over what was the greatest PC air combat game of all time has to include Dynamix’s 1990 classic, Red Baron. 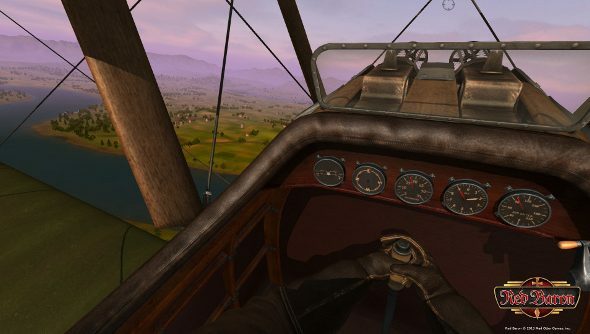 It struck a terrific balance between realism and accessibility, then wrapped the entire package in an air of aerial romance and adventure that was so perfect for the early days of air combat. Now, over a decade since the release of the final pseudo-instalment of the series, 1998’s Red Baron 3D, Dynamix veteran and Red Baron creator Damon Slye is attempting to bring the series back to life via Kickstarter. It looks like an attempt to combine the best features of the original game with some brand-new multiplayer elements. Slye and his company, Mad Otter games, are asking for $250,000 to get this project rolling down the runways, in addition to their own quarter-million dollar investment that brought the project to its current prototype stage. Their plans, however, go well beyond simply remaking the original game. In addition to almost RPG-style campaign fans will remember, Mad Otter are also attempting to offer historical multiplayer missions and, yes, even some kind of aerial MOBA. It’s an ambitious and perhaps even eyebrow-raising plan, but one encouraging thing in their pitch video is that Mad Otter are very much aware of the difference between simulation fidelity and players’ sense of historical verisimilitude. Red Baron, like other classics of its era such as Lawrence Holland’s LucasArts dogfighters, was more about the flavor and popular mythology around early air combat rather than the physics and mechanical procedures involved. As air combat sims increasingly pursued the latter objectives, games like Red Baron effectively vanished. Mad Otter are also promising Oculus Rift support, as well as support for high-end flight sim peripherals like rudder pedals and 3-axis joysticks. Supposedly it will also work well with a mouse and keyboard thanks to some player-aids, but the full realism mode appears to be designed for those throttles and sticks you’ve got gathering dust on a shelf somewhere. Recapturing magic is not an easy thing to accomplish, but hopefully Mad Otter can pull it off with this project. It’s been too long since Red Baron has been letting players sample the life of a WWI flying ace.